Toray Industries is a Japanese multinational corporation with headquarters in Tokyo and operations in 20 countries worldwide. 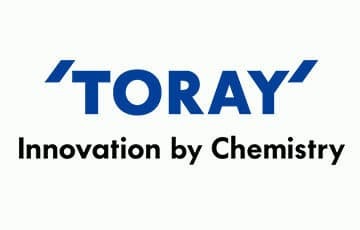 Listed on the Tokoyo Stock Exchange and on the TOPIX100 and Nikkei 225, Toray specializes in polymer chemistry, organic synthetic chemistry and biochemistry. Toray’s founding areas of business were textiles, fibers and plastics. However, over the years the company expanded and diversified into biotechnology, pharmaceuticals, electronics, engineering and advanced composite materials. Toray Industries is the world’s largest producer of carbon fiber, which is extensively used in the construction of the Boeing 787 exterior. Their top competitors include Shenzhou International Group Holdings Ltd, the SGL Group and Solvay. Toray Industries was established in 1926 under the name Toyo Rayon by parent company Mitsui Bussan, one of the two largest Japanese conglomerates of the era. Their first venture – producing high quality rayon – required the recruitment of 27 foreign engineers to develop the right technology and took place in 1927. By 1941, Toray had synthesized polyamide to make nylon and built a small manufacturing plant to synthesize an melt-spin Nylon 6 fiber. After being long-time rivals and competitors with polymer and textile developer Du-Pont (E. I. du Pont de Nemours and Company), the two joined forces in 1964 to form a new company based in Japan, Du Pont-Toray Co., Ltd. to develop polyester elastomer, polyimide film, and para-aramid fiber. The next year Toray New York, Inc. was established. In the 1980’s Toray opened offices in Seoul and Beijing and expanded into the construction industry. In 2000 the company continued to expand and launched Toray Advanced Computer Solution, Inc. In 2016 Toray announced their plans to build an R&D Innovation Center for the Future. The Center, which should be completed in 2019, will serve as headquarters for Toray’s global research. Toray Industries operates in five distinct business areas: Fibers & Textiles, Performance Chemicals, Carbon Fiber Composite Materials, Environment & Engineering, and Life Sciences. Fiber & Textiles: Toray produces all three types of synthetic fibers, nylon, polyester and acrylic in several different forms including filament yarns, staple fibers, textiles and garments. Performance Chemicals: The company operates in four specific product areas: resins, chemicals, electronics, and information materials. Toray products are used in the automotive and electronics industries. Carbon Fiber Composite Materials: Toray’s development and production of PAN-based carbon fibers are mostly used in the aerospace industry. Environment & Engineering: This diverse business area includes water treatment equipment, water treatment membranes, as well as construction materials and engineering equipment. Products include air filters for air conditioning, artificial turf, wall sidings, and nylon fiber for the prevention of cracking and falling of wet materials. Life Sciences: Toray produces medical and pharmaceutical products including the TORAYLIGHT™ Hollow-fiber Dialysis Machine, the Balloon Catheter/Ablation System for Arrhythmia Treatment and other products like contact lenses and blood purifying devices. The Toray Services division works in systems integrations, and research projects. Toray Industries has a firm corporate mission and set of guiding principles that include safety, environment, ethics, innovation, human resources and global competitiveness. Employing over 46,000 people worldwide, Toray Industries is led by President, Akihiro Nikkaku. The company has a well-entrenched corporate social responsibility program that includes priority areas of health & welfare, environment & communities and the promotion of science and technology.